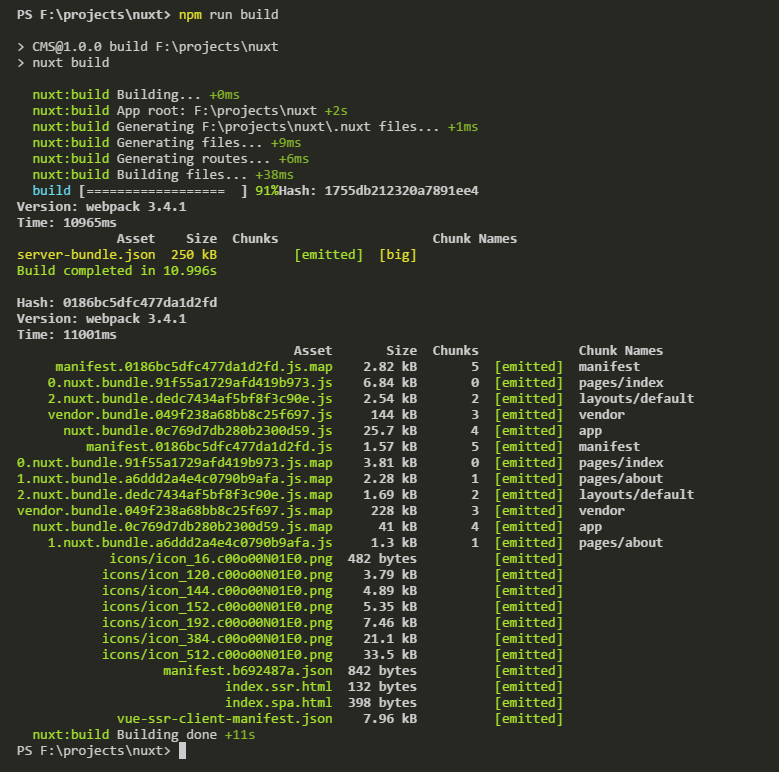 This repository template still on progress or not ? What are the best nuxt.config.js for pwa template? Hello @pi0 , now I'm starting to play with this template and I didn't saw much difference from webpack starter template, only the module @nuxtjs/pwa enabled. What else should I enable to get the best performance from pwa/nuxt/etc? Any rule I should avoid to enable it? I see that opening braces are placed in a new line rather than the same line with a space. Please consider using the suggested style. I'm getting the following error when I run npm run dev. 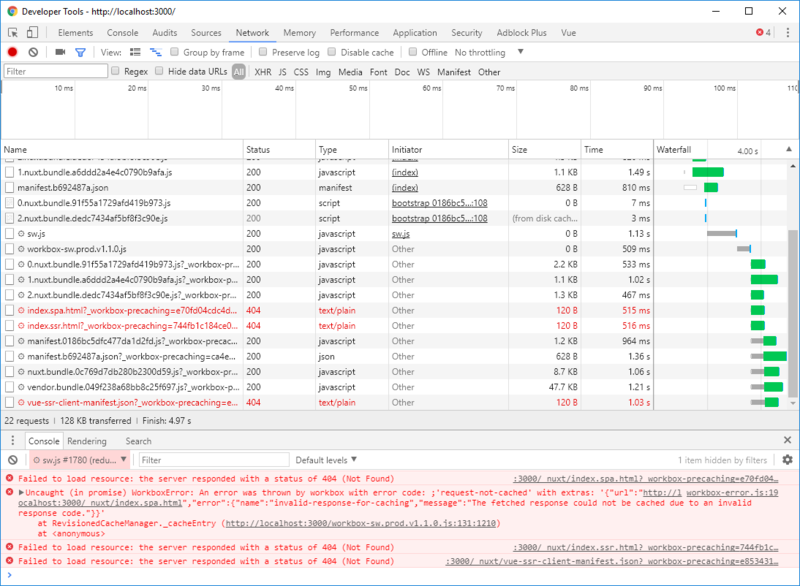 I'm getting this errors while navigating this template with only an extra page (eg: about.vue). The server cannot found the index.spa.html, index.ssr.html and vue-ssr-client-manifest.json files, but those files exists in the dist folder. I just ran the installation and trying to build the project as is, but got an issue. 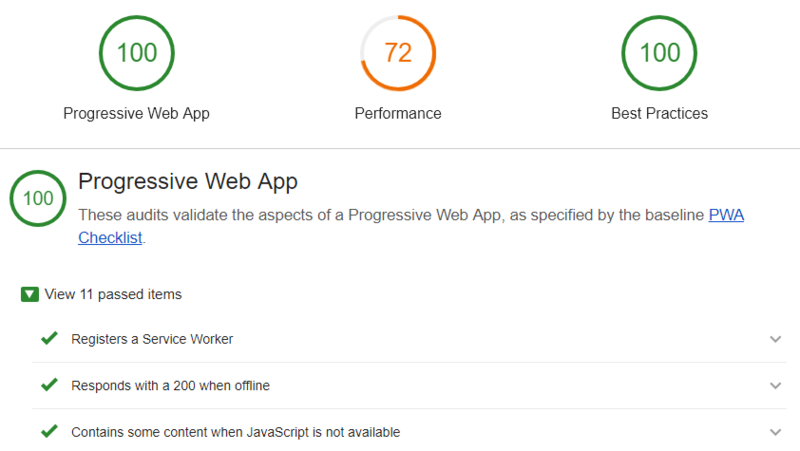 Even get 100 marks of PWA in google chrome audit analysis, but i when i use my mobile to access my website also not showing add to home screen. I can't find a way to add custom code (eg push notifications, etc.) to the service worker when using the pwa (workbox) nuxt module. Is there a way? How can you setup forced https redirects? Thank you! I'm wondering if updates to the cached files are handled automatically / semi-automatically with version number? When running this and visiting the website while online, the service worker is installed just fine. But when visiting the site while being offline, the service worker does not serve the application. Maybe I'm missing something, but shouldn't one benefit of service workers be that the application is available even though the user is offline?